First of all, excuse the following over-simplifications. “Oriental ice cream” covers quite a diverse field so this is mainly an attempt to highlight three main aspects of this rich tradition. One technique, which uses (corn) starch as stabiliser instead of eggs, is sometimes labelled “Oriental” (I have previously done so myself). This style is, however, also well known in Southern Italy. While Sicilian gelato almost certainly has strong Oriental roots, it is therefore also a European ice cream tradition with a very long history in its own right. Corn starch-ice cream will mainly be covered further in my post on Sicilian gelato. You will, however, still find such a recipe with Oriental flavours below. 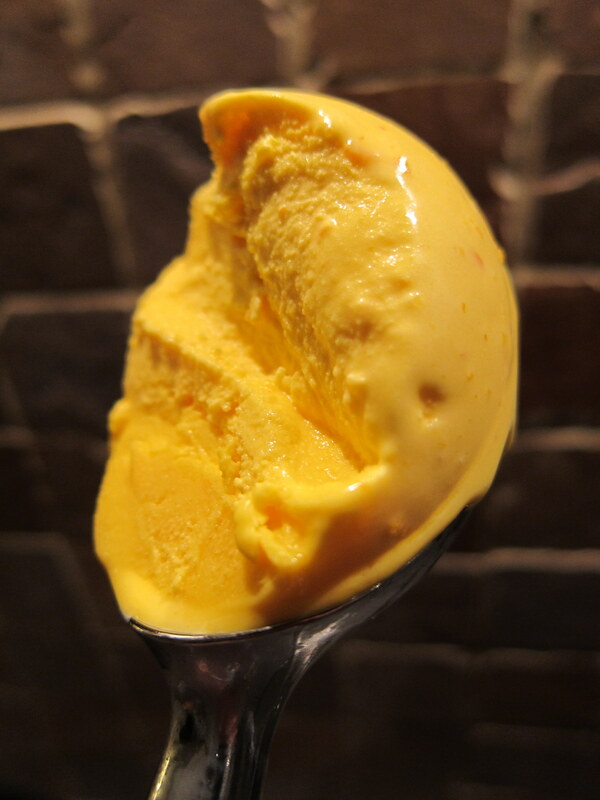 If we consider “Oriental ice cream” in terms of techniques and ingredients, the main defining features would (broadly speaking) be that these ice creams are prepared without eggs, and use different stabilisers (such as starch, mastic (arabic gum), Gum arabic or similar). These stabilisers tend to bring different degrees of more “chewy” textures to the ice cream, taking us from Sicilian gelato (corn starch) to Bouzat haleeb and Kaimaki (corn starch, sometimes salep, and mastic), and ending up with very particular ice creams such as the legendary Turkish Maraş Dondurmasi (outside Turkey often referred to just as “Dondurma“; mastic and salep). Blend 200 ml (0.8 cup) of the milk/cream with the corn starch, making sure that there are no lumps. Set aside for now. Blend the remaining 500 ml (2 cups) of the milk/cream, the sugar, the salt and the cinnamon stick in a pot. Warm until steaming hot on medium heat. Now, blend in the corn starch mixture with the rest of the ingredients in the pot. Barely reaching a boil, cook and stir for about five minutes, or until the mixture begins to thicken. Reduce the heat and continue to stir for another five minutes until the mixture has thickened even further and any possible “floury” taste (from the corn starch) has disappeared. Take off from the heat, add the rose water and let the mixture cool down. Refrigerate for a couple of hours, remove the cinnamon stick and freeze according to the instructions of your ice cream machine. A note on the recipe: As noted above, this base recipe is almost identical to the one for Sicilian gelato – by omitting the rosewater, this base can be used with almost any ice cream flavours. Since I am very fond of (corn) starch-based ice creams myself, I recommend every ice cream lover who has not yet tested to try that out – you are likely to get pleasantly surprised. If you want to increase the “stretchiness” of your ice cream beyond the normal, you might simply experiment with adding even more starch to the ice cream base! UPDATE: Go here for a delightful variation on Sicilian gelato (but stabilised with Arrowroot as prefered starch) which is many ways turns out to be more ‘Oriental’ in feel than when made with corn starch: Orange blossom ice cream! Pulverise the mastic (since it is a resin, it may be easier to handle if you first freeze it for 10-15 minutes and then put the resin drops together with a couple of teaspoons of sugar in the mortar). Whisk together the corn starch and 200 ml (0.8 cup) of the milk, making sure that no lumps are left. Set aside. Whisk together the pulverised mastic with the rest of the milk/cream and the sugar, warm until steaming hot and until the mastic has dissolved. Just before reaching a boil, add the corn starch-milk. Stir continuously on low heat to avoid any lumps for at least about 10 minutes, until the mixture has thickened. Remove from the heat, add the rose water (if desired), and let the mixture cool down. Refrigerate for a couple of hours, and freeze according to the instructions of your ice cream machine. 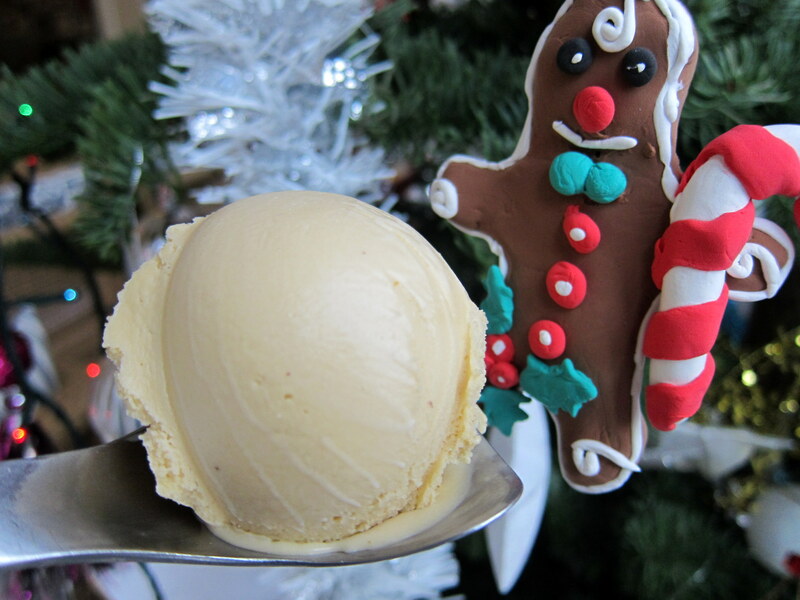 NOTE: Mastic brings a very peculiar taste (roughly speaking, think “Pine tree”) to the ice cream, so you may consider to lessen the amount you use, or add other flavours to “balance” the mastic-one. UPDATE: Go here for a whole post devoted to delicious Greek Mastic ice cream! Some classical oriental flavours you might want to add and explore could be pistachio, or orange flower/blossom water. A sprinkle of chopped almonds could also be nice. Genuine Dondurma (or Maraş Dondurmasi, to be exact – “dondurma” in Turkish only means ‘ice cream’) is made on Salep (Sahlab) instead of more ordinary starch. The salep acts as a thickening agent and imparts a specific extra dimension of chewiness way beyond what is possible to achieve only with ‘ordinary’ starch. It is difficult to describe the texture-sensation, but imagine eating a chewy type of ice cream in which someone has hidden a soft, rubbery and semi-solid core (which, however, seems to avoid capture whenever you take a bite). Described like this, it does sound quite strange, does it not? I should therefore like to add that, while rather different from your usual ice cream-experience, I found it very nice. Sadly, however, Dondurma is – in nature-protection terms – currently not a very sustainable ice cream. Salep flour is made of the orchid tubers of a rare orchid which are picked while the plants are in bloom. 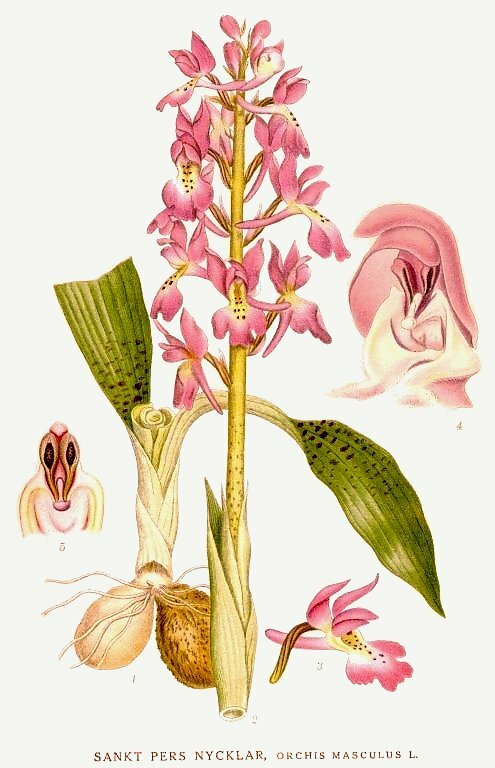 Consequently, they won’t be able to set seed and the plant is also destroyed (The orchid in question – Orchis mascula – is even on the CITES Convention’s list of endangered floral species; another reason why export of Salep from Turkey is forbidden). In other words, there are many good reasons why it is preferable to seek out a salep-substitute! There are several suggestions as to the best salep-substitute. Many people stick to starch (see above), while acknowledging that this does not provide the characteristic thickened stretchiness of Dondurma (and they are right – corn starch alone cannot replicate the particularities of the ice cream). The closes resemblance, if using more ‘ordinary’ types of starch is probably brought about by Arrowroot. Others (notably Harold McGee) have suggested using some guar gum (E 412) or Japanese konjac (konnyaku) flour. A combination of Konjac flour and locust bean gum (E 410) has also been suggested to bring about an acceptable Salep-resemblance. A quite ambitious project to search for the perfect substitute by the International Culinary Center has reached the conclusion that a mixture of gellan and guar gums ( E418 and E 412, respectively) come very close to “the real Dondurma deal”. Don’t forget to beat your Dondurma! When trying to make Dondurma, remember that the ice cream base in all cases needs to be worked hard, pretty much like a dough. After the ice cream base has been frozen (in your ice cream machine, or by using still-freezing methods) – arm yourself with a wooden spoon, place it in a mixing bowl and beat it for at least 15-20 minutes to develop the stretchiness. Combine the milk, cream, and tea leaves. Infuse the mixture in a vacuum bag at full vacuum plus 30 seconds. Allow to steep till flavor is developed (about 1 hour). Strain tea from milk/cream mixture and add gellan, salt, and guar. Whisk vigorously to combine (this step disperses the gellan and begins to hydrate the guar). Bring the mixture to a boil while stirring (to hydrate the gellan). Simmer for 1 minute (ensures the gellan is hydrated). Remove from heat. Add sugar and vanilla and stir (drops the temperature a bit). When mixture drops to 83 or 82C add the egg yolks and stir (if you go higher you might curdle the eggs. The yolks increase the creaminess of the recipe). When the temperature drops to 70C mix in the calcium and stir (I read a reference that calcium added to milk/gellan systems might cause problems if added above this temperature. Calcium added below this temperature will also cause problems). Put mixture in an ice bath to set. When mixture is completely set, blend in a high-speed mixer till creamy. Freeze with liquid nitrogen in a Kitchen-Aid mixer fixed with a paddle attachment. Beat until the ice cream gets stringy and stretchy. To make creamy ice cream without the Salep feel omit the guar gum and increase the gellan to 7 grams. ]. Best of luck – I would love to hear your views in case you try that one, or any other way to re-create Dondurma! Great site, I love “good” ice cream. I have bought an ice cream maker so raring to get started. Well, in fact I’ve had a few goes but results although OK were not great. Coming from Greek parentage I can remember back what the ice cream and other goodies tasted like I now have the mastic gum so ready to go, I also bought some Salep but it’s not the flour but the drink, it contains 6.5% salep flour, would you have any thoughts on the amount I should add to a litre mix. Generally speaking, I have seen the advise that one should calculate with using about 4-5 times the amount of ‘original flour’ called for, if using the salep drink mixture. Since those drink mixtures often contain sugar, it would also be a good idea to remember to reduce the overall amount of sugar in the ice cream accordingly. In case you do not have any ‘original amount of flour’-recipes to calculate from, I would suggest trying out with about 70 ml (about 1/3 cup) of the mixture for a batch of 1 litre. Best of luck and I would love to hear back from you on how your ice cream turns out! What I did omit to tell you was about 10 years ago I met a Lebanese ice cream maker in London (I repaired his Carpigiani ice cream machine) he made some ice cream once I had repaired the machine, Pistachio ice cream which was amazing I did ask about his mix but of cause it was a highly guarded secret and although my batch was good not quiet up to his standard but I’m happy and feel I can only improve. I don’t really want to condone the use of real salep (given the endangered status of the orchid involved), but the amount of salep flour used for a litre (about 4 cups) of liquid should likely not be more than about 2 tablespoons. I tried using a bit of xantham gum in a batch of super-dark fudge gelato. I think I used too much chocolate (both powder and 80% bar chocolate) which made the result the consistency of fudge topping (as in hot fudge sunday, except cold), but the xantham gum made it very smoothe and held it together. I have saved it in the freezer. It is soft when frozen. I am going to use it to swirl through vanilla and coffee gelatos (by hand) after processing the gelato in the ice cream maker. I used a bit more than half a teaspoon of the powdered gum in the recipe that produced about 3 cups of product. Next time I make gelato I’m going to use less. I do like the texture it provides. Is it the Salep or the Mastic that gives the stretch to Turkish Ice Cream? Or is it a combination of both? I’m wondering if I can keep the texture yet go for more western palate friendly flavors by using gum arabic and arrowroot. While I believe that the Mastic may contribute something, the main “stretch-giver” is clearly the Salep. I encourage you to experiment with the texture – the best way to find out if gum arabic and arrowroot works is probably simply to test! Hello Mr. Anders, many thanks for so useful information about DONDURMA… I’m interesting where I can buy Salep and Mastic? writing from Georgia (Tbilisi) and can’t fined in Tbilisi anywhere…. can I buy it on AMAZONE or EBAY? I mean if every Salep which is on websites is made of ORCHID ROOTS? and if every Mastic corns is from CHIOS island? As you can read in the article, trade with genuine salep is basically forbidden (for good reasons), so legally obtaining it should be difficult (salep used for drinking purposes is usually mixed with other ingredients but could perhaps do in a pinch). The Greek mastic from Chios, however, can be freely bought on the internet, including via Amazon. Mr. Anders thanks for your reply and one question PLS, if we can’t get Salep legally, so we have to use GUAR GUM or GALLEN GUM or XANTHAM GUM to make dondurma, I’m interesting if these substances are harmfull for health??? as I this all these substances are GMO products…. While there is an on-going debate about food additives in general, and while some people may be extra sensitive to some of them, all the mentioned stabilisers are commonly used. As far as I can tell, they have all been approved for use as food additives both by the European Union (each having been assigned so-called E-numbers), and by the United States Food and Drug Administration (FDA). Whether some of them may be based on GMOs could depend on the manufacturer, so you would need to check that before buying. Nope. You are hopefully much better situated than me to check the market(s) close to where you are. Best of luck with your plans! Have recently discovered your website and I want to try this particular recipe with the starch. Thank you for sharing your extensive knowledge about my favorite food. really very useful information and valuable information. I wounder if it is possible to make this oriental ice cream with different fruit flavors(lemon, Guava,Mango..etc) and how. and could you recommend me of a good quality brand natural flavor to use . Yes, it is certainly possible to make ‘oriental ice cream’ with fruit flavours: I would suggest that you begin experimenting with the Sicilian gelato-base and add, say, about 250 gram of puréed fruit + some extra sugar to sweeten it with (there should be several recipes on the site you could search inspiration from): add the sweetened purée to the ice cream base just before churning for a fresher, less “jam-like” overall flavour. Hello, I found this website while I was looking for a substitute for sahlep in ice-cream making because I cannot find it in the place that I am living now. You are saying that mastic or starch cannot do what sahlep can do. So what do you think I should use instead of sahlep? As you can see in the post, some people suggest using guar gum (E 412) or Japanese konjac (konnyaku) flour, or a combination of Konjac flour and locust bean gum (E 410). If you look through the comments to the post above, you will also find a recipe which uses a mixture of gellan and guar gums (E418 and E 412, respectively), which supposedly should come very close to “the real Dondurma deal”. If you try any of them, please let me know how it turned out! Great post; I am currently obsessed with trying to make this. My question is this though…instead of the wooden spoon and hard labor to get the stretchiness, couldn’t I pour the mixture from my ice cream machine into my Kitchenaid with the dough hook or the paddle to do its magic? I suppose you’re trying your hand at Dondurma ice cream-making? Sure, you can certainly try with your Kitchenaid/dough hook – after all, if it doesn’t work out (the ice cream might turn out to be too thick and/or stretchy to work properly in the machine), you’re bound to find out rather quickly. Grab a wooden spoon for possible backup and give it a go! Best of luck! Thank you Anders…..After much online “studying”, I have decided to go with the method demonstrated on YouTube by a gentleman in Turkey that makes/sells Dondurma. He explains that to get the stretchiness he continuously ladles the mixture back into pot over and over again while it is cooking on the stove. So he does it before he freezes it. I have 1/2 cup of Salep that I will never see again in my lifetime, and I’m treating it like gold. So I don’t want to mess this up. I am slightly terrified. I’ll keep my fingers crossed for you then 😉 – Best of luck! You’ll have to ask the originators of that recipe about why they added tea leaves, but I would guess it was done to add to the flavour. Personally, I think you probably could do without them. 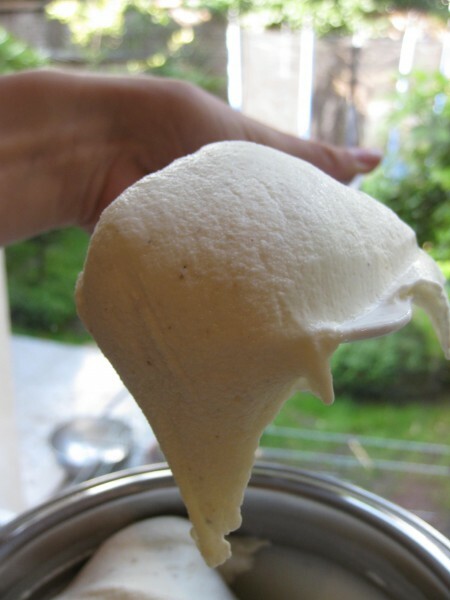 Dondurma will probably be tricky to make solely in an “ordinary” ice cream machine because of its stretchy consistency: you may have to resort to manual pounding and/or a kitchen mixer (like, one which you would use for kneading dough). And yes, I have tasted “flavoured” Dondurma so different flavours can be done (I still liked the “natural” best, though 😉 ). 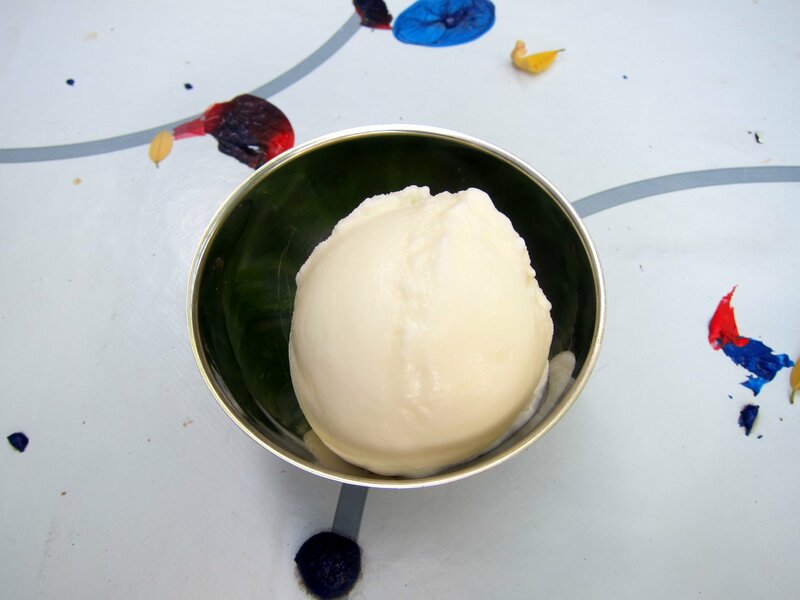 “Base recipe – Oriental style ice cream I Starch-type” Did that stretch with you like Dondurma?